We have lots of goodies to share with you this month so lets get started. First up is the new designer collab kit, Haybales and Harvest Time! This is a fantastic kit full of everything you need to scrap your pictures this fall. You can pick up the kit, quick pages, or bothof them in the bundle. Bits N Pieces is all about sports this month. There are so many different ones to choose from, you're sure to find something you'll love! Each piece is just $1 through the 7th. Don't forget about the BNP challenge, use the pieces you pick up to create a layout and earn some points! Growing Pains Scrapped has put together a fabulous free with purchase kit, Fresh. This kit is free with any purchase in the store of $10 or more. 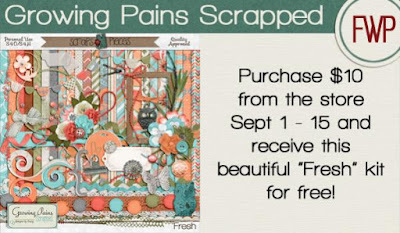 Scrappin Serenity and Manda Lane Scraps have teamed up for a super cute fall inspired Daily Download. Remember to stop by the blog each day this month to pick up all the pieces then put a fantastic layout together for the Scrap the Pieces challenge in October! Now that many of you have kids back in school, why don't you use some of that extra time to join in on a speed scrap or two, or three! We have a great group of hosts again this month that will be giving out instructions over the course of an hour. In return, you'll have a layout complete and a participation prize if you submit it before the deadline.